Cell Phone Number Portability – Gotta Have It. 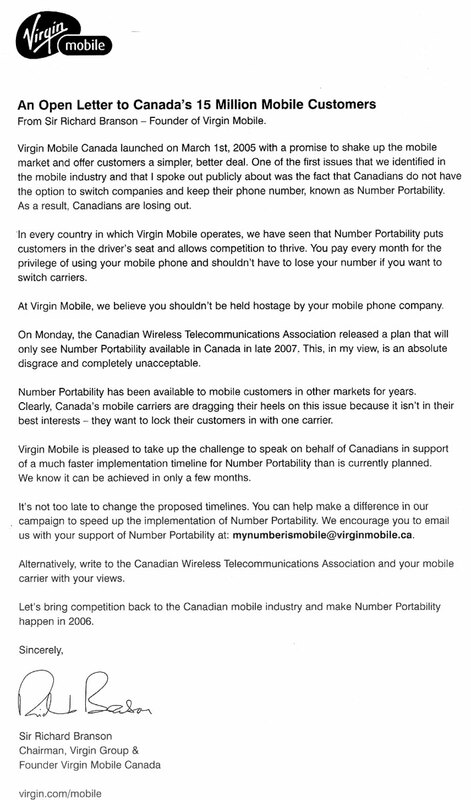 Richard Branson has taken out a full page ad regarding cell phone number portability in Canada. This one’s in the Globe – not sure where else it ran. or grab a pdf version here. At issue is the ability to keep your cell phone number when you switch carriers. For most of us, keeping a number is important. But, as Bransons ad points out, the Canadian Wireless Telecommunications Association has recently released a plan that will only see number portability available in Canada in late 2007. Huh? 2007 ? Weve had limited number portability for land lines  I moved my Telus landline number to a mobile carrier. But thats it  do that once and youre done. And dont even think about moving a cell number. Not in Canada. The CWTA is also the same group that makes getting a short code (for texting) in Canada some kind of medieval ritual. In the US, you can get a short code just like registering an URL at http://www.usshortcodes.com/ its not cheap  1,000 USD for a number you pick, 500 USD for a randomly assigned short code. Not so in Canada. In the full page ad in the Globe, Branson points out that in every other country in which they operate, number portability increases competition. In Canada’s phone business, the c word is a dirty word. Branson’s ad says its not too late to light a fire under these guys. How? Speak up if you want number portability. The mail link will get you started, just add what you want to the message. And pass this page along to your friends – here’s the permalink to this page: http://blog.bigsnit.com/index.php/2005/09/14/51. Previous PostQuick takes on what's hot today.Next PostNew Music Site from Vancouver. Rogers says phone number portability is coming march 2007. As of Nov 2006. Hurah its not late 2007. Well little hurrah.